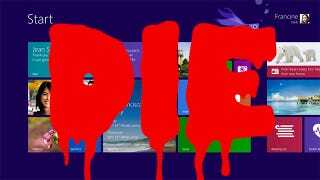 Here's where embarassing corporate backpedalling is a good thing: according to The Verge, the next update for Windows 8 will see every machine boot straight to the desktop mode by default. You know, like we used to, in the good old days. While there's long been an option to boot straight to the more conventional desktop rather than the tile-based "Metro" UI, "sources familiar with Microsoft's plans" have told The Verge that the operating system's next update will enable this by default. The Metro's tile interface is pretty neat for tablets and touchscreens, but for regular desktop PCs it's a nightmare. The backtrack is a result of Microsoft's "telemetry" revealing that the biggest percentage of Windows 8's users are old-fashioned desktop + mouse types who use old-fashioned programs, not these new-fangled app things. If true it's a welcome move, which along with the return of the "Start" button sees the operating system return to the kind of experience desktop users should have had by default in the first place. And while we could be congratulating Microsoft on paying closer attention to the people actually using its products, The Verge highlights another possible reason for the changes: support for Windows XP ends in April, so millions of businesses will be moving to Windows 8. And those people need old-fashioned stuff like Start buttons so they can get stuff done.